What Weight Kettlebell Should I Get? Jessica Herschberg has been writing professionally since 2010. She has helped over 150 clients lose weight and become healthier through her extensive knowledge of weight loss, metabolic efficiency, and sports nutrition. She is a certified USA triathlon coach, a sports nutrition specialist with the International Society of Sports Nutrition, and a certified personal trainer with the National Society of Sports Medicine. If you have been considering purchasing a kettlebell, you might be concerned about picking the right size. Kettlebells are more expensive than dumbbells and must usually be purchased over the Internet with high shipping charges. There are some guidelines that will help you select the right size for your needs and provide you some peace of mind that your money will be well spent. While kettlebells have been around for many years, they have only recently gained enough popularity to begin to be sold in national retail stores. As most people have never used a kettlebell before, it is not easy to know which weight to start with, especially since a kettlebell will place much different demands on your body than a dumbbell of the same weight, both because of its shape and the exercises unique to kettlebell training. There are a two different types of kettlebells to consider--regular and adjustable. A regular kettlebell is the most common type and has a fixed weight. An adjustable kettlebell is hollow and can be filled with sand or buckshot to adjust the weight. If you anticipate using your kettlebell as an occasional addition to your training, an adjustable kettlebell will work and will take up less space, although it won't be as convenient if you want to use a different weight on different days. 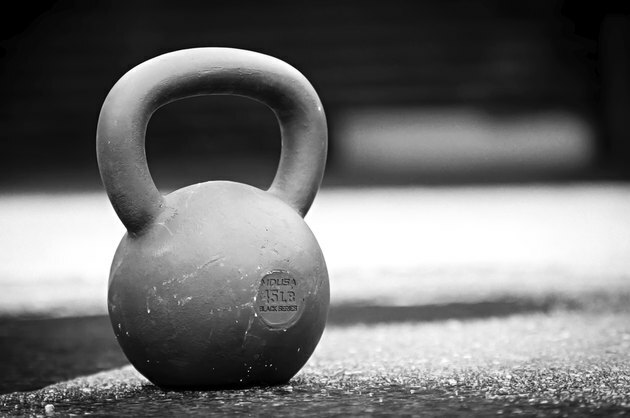 If you plan to use the kettlebell more consistently, it is best to buy a regular, fixed-weight bell. Kettlebell weight is most frequently measured in kilograms rather than pounds. They start at 4 kg and move up in 4-kg increments. The most widely used sizes for general fitness are 4 kg up to 24 kg. Most people should start with a kettlebell weight of between 8 kg and 16 kg. A beginner female should start with an 8-kg bell, as the 4 kg is not heavy enough to provide a solid weight lifting effect for most women. Women with more weight lifting experience and fitness can start with a 12-kg bell. A beginner male will do best with a 12 or 16-kg bell, depending on current fitness level. If you are familiar with weight training and moving with weight, then 16 kg can be appropriate. If you are new to strength training, a 12 kg will suit your needs better. Some kettlebells allow you to increase the weight by 2-kg increments by screwing an additional weight into the bottom of the kettlebell. This can give you greater flexibility with your workouts and also help you move up in size more gently. Additionally, the handle size varies from one manufacturer to another. If you are new to strength training or have small hands, check to see if the kettlebells you are comparing have different handle sizes for different weights and buy accordingly. You may want to purchase some gym chalk to use with your kettlebell, as this can improve your grip on the handle. Expect to take some time to develop your grip strength and try to use your kettlebell without gloves, as these can sometimes mask the use of improper form. Some kettlebells have a colored vinyl coating. This can protect your floors and provide an easy way to identify different weights. Finally, if your new kettlebell has a very slippery handle, you can gently sandpaper the handle to help chalk stick to its surface better. How Much Weight Do I Need for Dumbbells?